Along with this, School ERP provides you the facility of maintaining records related to your daily monetary transactions such as student fees records, teacher's payment records, loan/advances to employees as well as records related to Bus operations, Library, Payroll, Infirmary, Front-Office and amazingly, all this under one Platform – School ERP. 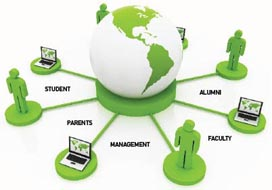 School ERP provides you Data Security Feature with minimum user level Access Control. You may view various reports for smooth functioning and standardization of all system activities taking place inside your Institution.